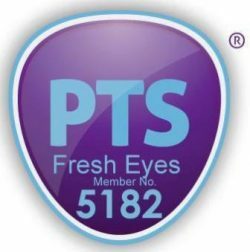 Uttarakhand is a state in the northern part of India which has some of the most outstanding areas of natural beauty as part of the Greater Himalaya range with beautiful and breath taking valleys, peaks and glaciers. Two very important and holy rivers of India, the Ganga (Ganges) and Yamuna start their journey from here. It is often referred to as the Devbhumi (literally “Land of the Gods”) due to the many Hindu temples and pilgrimage centres found throughout the state. 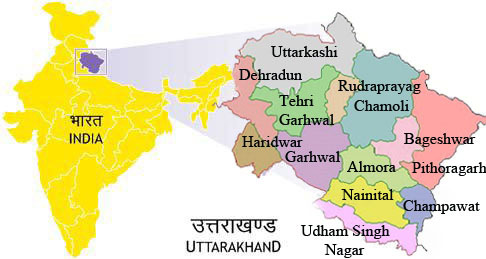 Uttarakhand was created in 2000 from the Himalayan districts of Uttar Pradesh. It borders the Tibet Autonomous Region, China on the north; the Mahakali Zone of the Far-Western Region of Nepal on the east; and the Indian states of Uttar Pradesh to the south and Himachal Pradesh to the northwest. The state is divided into two divisions, Garhwal in the west and Kumaon in the east. Mid-March to mid-June Spring to hot summer, getting warmer during the day and night each month. The higher you are the cooler it is. April and May are good months to travel. July–mid-September The rainy Season – Monsoons may make travel more difficult with often challenging road conditions. Mid-September–October The perfect time to walk and trek the Himalayas. Mid-November to February Winter sets in with certain areas of the hills becoming inaccessible with, depending on the altitude, prolonged snowfall. 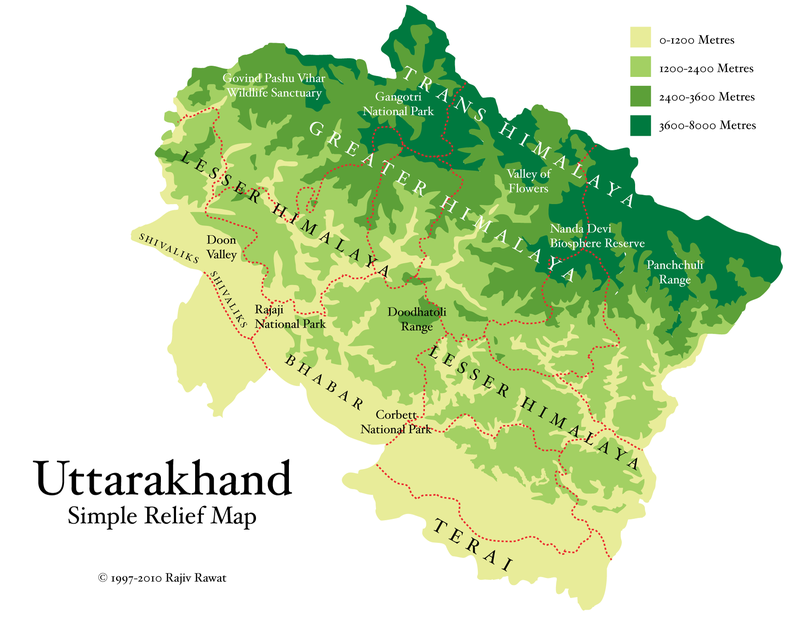 Uttarakhand mainly has two sharply differentiated climatic regions, the plains and the mountainous regions. The climate in the northern part of Uttarakhand is typically Himalayan with major differences depending on altitude and position. This mountain range has a great influence on monsoon and rainfall patterns. In the plains the climate closely resembles the rest of the Gangetic plain. Summers are exceedingly hot and often humid with temperatures crossing the 40°C mark. You can encounter a cold alpine climate at higher reaches where summers are cool and winters are harsh. Winters can be cold with temperatures going below 5°C at times. At altitudes over 4880 meters (16,000 feet), the climate is bitterly cold with winter temperatures consistently below the freezing point and the area perennially shrouded in snow and ice. 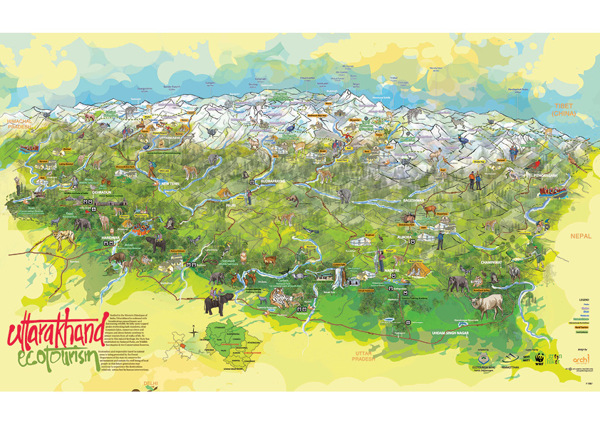 Summers in the plains region of Uttarakhand have a climate similar to surrounding plain regions of the different Indian states with the maximum temperature crossing the 40°C mark and often with considerable humidity. Warm temperatures around 25°C prevail in the Middle Himalayan valleys making it ideal for people of the plains to beat the heat. In the higher areas of middle Himalayas the temperatures are around 15 to 18°C, still pleasant. The season extends from April to June. Uttarakhand during winter in the plains region can be cold with temperatures going below 5°C mark. The winters in the middle Himalayan valleys are very cold and in the higher areas the temperature can often drop below the freezing point. The Himalayan peaks remain snow-capped throughout the year and many places receive regular snowfall. Throughout the state the temperature ranges from sub-zero to 15°C and the season lasts from November to February. The monsoon between July to September has temperatures between 15 to 25°C in most places. 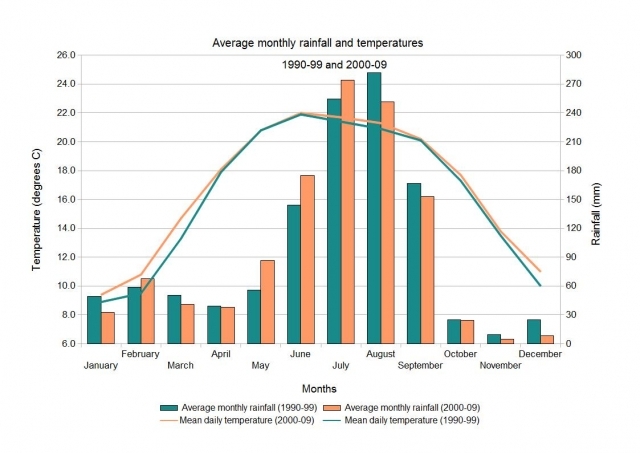 The state receives 90% of its annual rainfall in this season. The eastern parts of Himalaya are subjected to heavier rainfalls while western partsare relatively drier. Uttarakhand has a very simple, yet delicious cuisine. The primary food of Uttarakhand includes vegetables, pulses and roti (flat bread). Coarse grain with high fibre content is very common in Uttarakhand cuisines. Dubka is a simple dish made from various lentils. These are grounded and a curry like dish is prepared from the grounded lentils and made with few local spices available in the Kumaon hills like jakhiya (Cleme Viscosa). It is usually made in an iron wok and eaten with rice or roti. Chains is a preparation of whole urad dhal which is first roasted then ground and then seasoned into a soup. Kaap is a dish prepared with spinach leaves crushed into a paste and cooked with other condiments. Jhoi is a curry seasoned with curd and curry leaves. Saag is a dish of green vegetables. Can be made from any of the various green vegetables like palak (spinach), methi (fenugreek). Bal Mithai is a brown chocolate-like fudge, made with roasted khoya (thickened milk), coated with white sugar balls. Visit WikiTravel for more information! View photos of travel in Uttarakhand with Fresh Eyes by using the Flickr button .